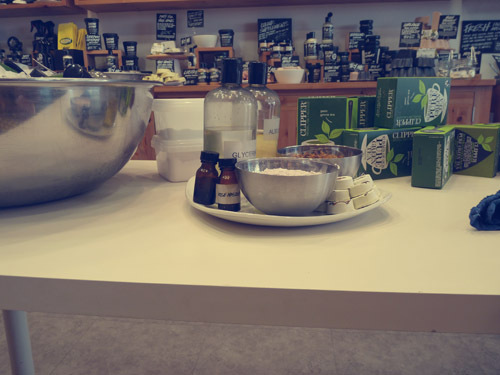 On Saturday my good friend Nicole and I went to Lush in Southampton for a face mask workshop that was part of a promotion being run by Clipper Green Tea. The instructions on the website said to go along without make-up so they could do a skin consultation and show you a cleansing routine but as I am convinced I look like the beast of Bodmin Moor sans slap I chickened out! When we arrived we discovered that there were supposed to be two others coming to the workshop but they had dropped out so it was just me and Nicole. Their loss was our gain as they had already measured out the ingredients to make the face mask so we got twice as much to take home with us, as you’ll see at the end! Here are all the ingredients, plus some Dream Steam steamer tabs. 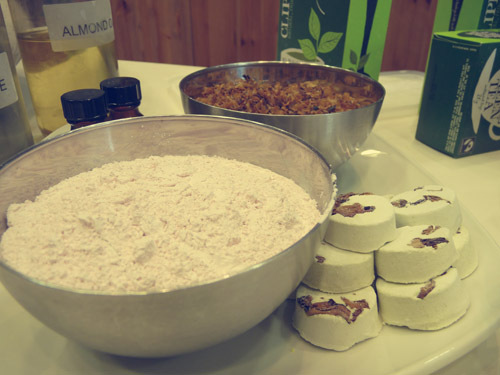 After we’d made our face masks, they were planning on showing us a cleansing routine using Lush products. Unfortunately as I’d worn make up and Nicole has uber-sensitive skin, the guy helping with the workshop had to be a model whilst the lady showed us a routine using Ultrabland cleanser, Full of Grace facial serum bar and the face mask that we made (Catastrophe Cosmetic). She wasn’t able to show us the steam tabs so we were given some of those to take away and try. They also talked us through a lot of the other products in the shop and answered any questions we had about the products or any recommendations for things that would work for us. 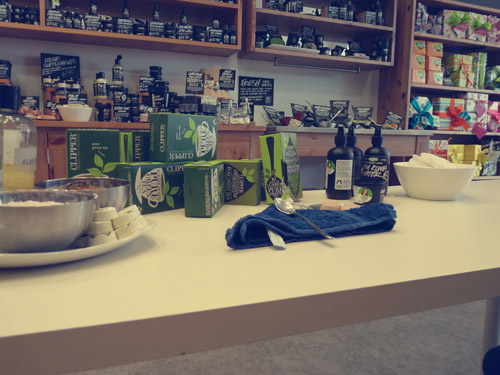 I was so impressed by how knowledgeable they both were about all of the products, the ingredients and how they were made. I came away with some Big Sea Salt shampoo to give my hair more volume, and a pot of the cleanser that was used in the demonstration. I’ve already used the shampoo and it’s absolutely great; definitely made my hair feel fuller and more uplifted and, of course, it smelt amazing. 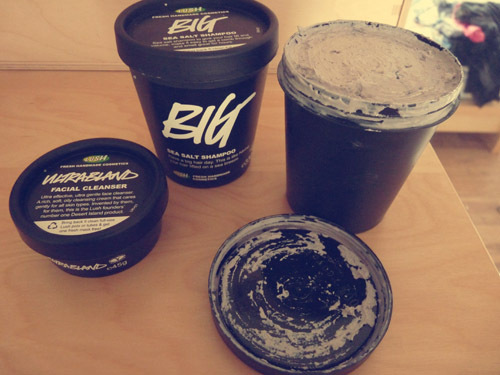 Check out the huge tub of face mask too – I’ve given some to my Mum and I know Tom will be trying some out as he’s quite into face washes at the moment! You have to keep it in the fridge because of all the fresh ingredients. I’ve used the face mask twice since Saturday and I am so impressed; my skin felt baby soft and so soothed afterwards, I’ll definitely be stocking up when my supply runs out! 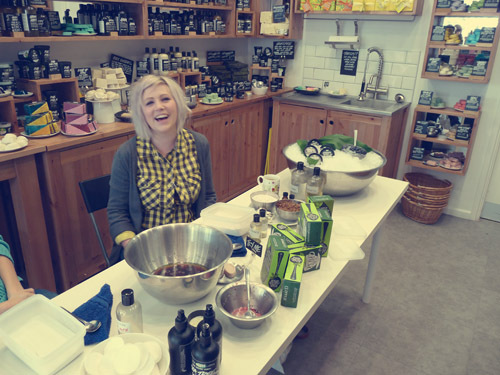 All in all it was an absolutely brilliant time and we owe a huge thanks to the people at Lush Southampton. If you want to go to a workshop, just pick up one of the promotional packs of teas (with the pink labels on) but hurry as it ends on the 28th April.